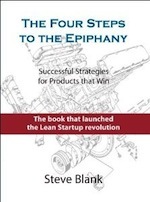 In the last five years “Lean Startup” methodologies have enabled entrepreneurs to efficiently build a startup by searching for product/market fit rather than blindly trying to execute. Companies or Government agencies pursuing innovation can Buy, Build, Partner or use Open Innovation. But trying to find a unified theory of innovation that allows established companies and government agencies to innovate internally with the speed and urgency of startups has eluded our grasp. The first time a few brave corporate innovators tried to overlay the Lean tools and techniques that work in early-stage startups in an existing corporation or government agency, the result was chaos, confusion, frustration and ultimately, failure. They ended up with “Innovation Theater” – great projects, wonderful press releases about how innovative the company is – but no real substantive change in product trajectory. Horizon 1 are mature businesses. Horizon 2 are rapidly growing businesses. Horizon 3 are emerging businesses. Each horizon requires different focus, different management, different tools and different goals. The Three Horizons provided an incredibly useful taxonomy. However in practice most companies treated the Three Horizons like they are simply incremental execution of the same business model. While these theories explain how to think about innovation in a company they didn’t tell you how to make it happen. Fast forward to today. To move innovation faster, we now have 21st century tools —Business Model Canvas, Customer Development, Agile Engineering – all adding up to a Lean Startup. 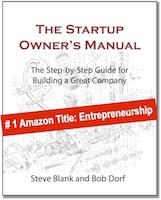 We can adapt these startup tools for use inside the corporation. a way for existing organizations to build and test new ideas at blinding speed. Horizon 1 activities support existing business models. Horizon 3 is focused on unknown business models. Innovation and improvement occurs in Horizon 1 on process, procedures, costs, etc. Product management for Horizon 1 uses existing product management tools such as StageGate® or the equivalent. In Horizon 2 a company/agency extends its core business. Here the company looks for new opportunities in its existing business model (trying a different distribution channel, using the same technology with new customers or selling existing customers new products, etc.) Horizon 2 uses mostly existing capabilities and has moderate risk in getting new capabilities to get the product out the door. 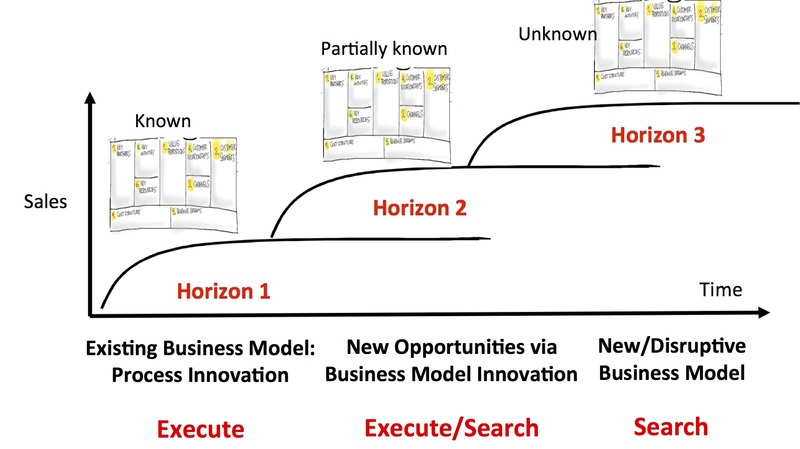 Management in Horizon 2 works by pattern recognition and experimentation inside the current business model. Horizon 3 is where companies put their crazy entrepreneurs. (Inside of companies these are the mavericks you want to fire for not getting with program. In a startup they’d be the founding CEO.) These innovators want to create new and potentially disruptive business models. Here the company is essentially incubating a startup. They operate with speed and urgency to find a repeatable and scalable business model. Horizon 3 groups need to be physically separate from operating divisions (in a corporate incubator, or their own facility.) And they need their own plans, procedures, policies, incentives and KPI’s different from those in Horizon 1. Product management for Horizon 2 and 3 uses existing Lean Innovation Management tools such as Lean LaunchPad®, the NSF I-Corps™ or the equivalent. Using these tools internally a company/agency can get startup speed and urgency. Horizon 3 organizations organized as small (<5 person) teams can talk to 100+ customers in 10 weeks and deliver a series of iterative and incremental minimal viable products. Given the minimum size of these teams and expenditures, companies can afford to run a large number of these initiatives in parallel. Horizon 2 and 3 activities are not entirely separated from the corporate structure. To help Horizon 2 and 3 organizations navigate all the processes, procedures and metrics the company has built to support Horizon 1 activities, individuals from support organizations (legal, finance, procurement, etc.) are assigned to work inside Horizon 3 organizations. Their function is to help Horizon 2 and 3 organizations navigate to a “Yes” inside the company. Horizon 1 operates on goals and incentives. And Horizon 1 managers need to be incented to embrace and support innovation going on in Horizons 2 and 3. Companies need their Horizon 1 managers to both encourage mavericks to propose projects, as well as to support mavericks and then incentive for adoption and scale of Horizon 3 projects. 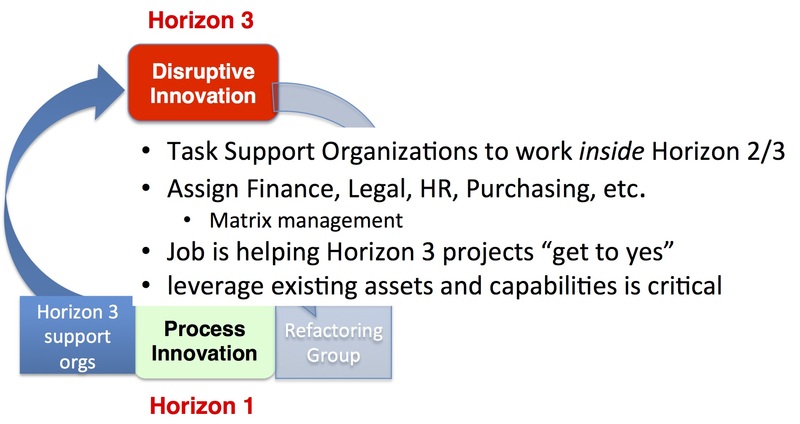 What happens to successful innovations from Horizons 2 and 3? They either get adopted by a Horizon 1 organization (a division, P&L, functional organization,) they reach a size large enough to become a standalone group or they can be sold/spun out. To make this work Horizon 1 execs and managers need incentives and job descriptions to support Horizon 2 and 3 activiities. 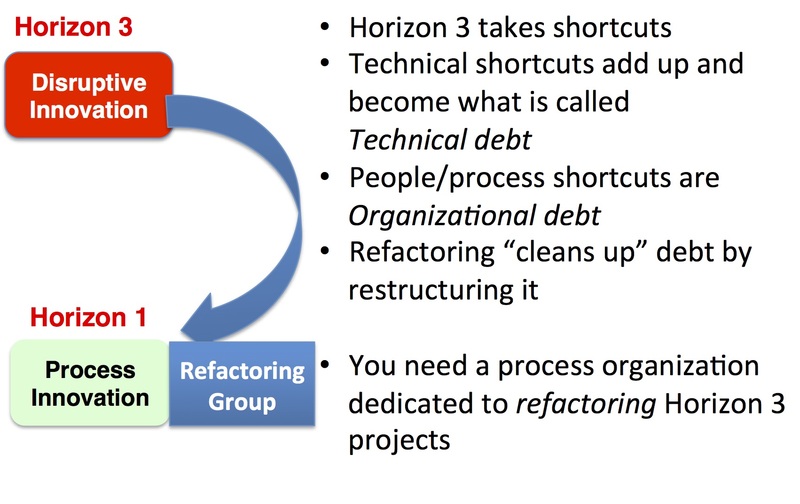 One of the biggest complaints from Horizon 1 managers is that successful Horizon 3 innovation projects leave a mess of technical and organization debt that a Horizon 1 organization has to clean up. This isn’t some exception; in fact it’s a natural part of corporate innovation. 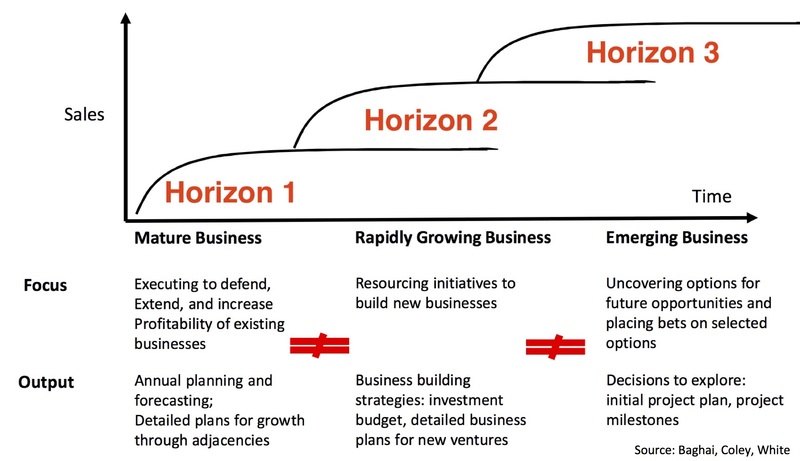 When a Horizon 2 or 3 program finds success, it can either grow on its own (and hence become their own divisions) or the founders and early employees may get folded back into a Horizon 1 organization that will scale the program. Typically this is a bad idea for all involved. In short-sighted companies the Horizon 2 and 3 innovators get frustrated, and leave. In far-sighted companies they get to start a new cycle of disruptive innovation. We have a common language and process for execution–product management tools, financial reporting etc. Yet we have no common language and process for innovation and searching for business models. 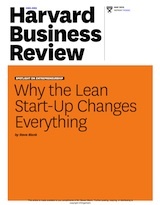 We can adopt the Lean Vocabulary–Business Model Canvas, Customer Development, Hypotheses, Pivots and Minimum Viable Products and Evidence-based entrepreneurship as the corporate language of “search versus execution.” And we can use Lean Metrics (Investment Readiness Level and Technology Readiness Levels) and Lean Portfolio management tools to provide rigor to go/no go funding decisions. Finally we can use the open-source lean classes from the National Science Foundation I-Corps and the Stanford/Berkeley Lean LaunchPad classes to run Horizon 3 projects. An ambidextrous company or government agency runs large numbers of Horizon 2 and 3 projects simultaneously while relentlessly improving the way it executes its current business model and serves its existing customers. This happen s when the C-level executives share a common strategic intent, a common vision, explicit values and identity, and they are compensated for both execution of the current business model and the search for new ones. They also realize that operating at all three horizons will require them to tolerate and resolve conflicts. I’m definitely the guy they want to sack… Wish I could find the right combination of people to see those attributes as an asset. I’ll keep searching! It would be helpful to see examples of companies that are using these processes on a regular basis. No doubt lots of companies have been on your course and there are probably a few that have 1-2 initiatives following the Horizon 3 process, but how many are doing this in volume–eg more than 10 initiatives. In addition, are there case studies of companies that have followed Horizon 3 and are now generating significant revenue? Hi Kerry, did Steve answer your question? Can you share with me please. First I want to congratulate for another sensational article. It’s really interesting to give examples of companies that use this process. Thanks for the article. I think we all agree the state and its various departments can really do with more lean decision cycles. I also feel the clarity on when to focus on the execution really helps. It helps to highlight the earlier you are in the business life cycle the less the emphasis on the execution ! This helps with nurturing mental models for the people involved in the projects / businesses. Excellent and timely article as we are just underway in developing our internal process for how we can innovate better through more “search and pivot” efforts. Echoing other here, but do you have any larger company examples of who has done this successfully to date. Even “sanitized” examples would be helpful. Thanks. Great post Steve, and I hope (with much appreciation) that you are writing a book about this. Unfortunately, I find most enterprises are stuck in the innovation theatre approach to innovation. Hi Steve, thank you for this great (and quote worthy) article. A question that I’m wrangling with: What could the incentives for Horizon 1 managers look like? Any examples of what has and hasn’t worked in the past? Thanks for the detail with so many links to other sources. I’m interested in how we train and develop people to be lean innovators. The moving beyond “innovation theater” is important! Hi Steve, this is a great framework and i’ve read many of your supporting articles, but struggling to find examples of companies that adopted this framework (or something close to it), and are making it work. Do you have any examples?